Rainwater systems in light gauge metal such as copper, brass, bronze, zinc, stainless steel or precoated aluminium, are becoming ever more popular as stand alone systems or to compliment a traditional metal roofing finish. We offer a standard range of rainwater systems, including half round, square or ogee guttering, together with round or square down pipes. A full range of accessories are available. 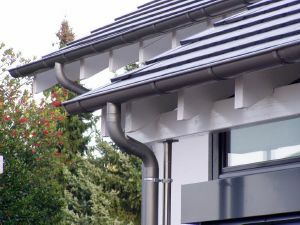 Rainwater systems can be manufactured in all traditional metals - please contact us if you have any special requirements.